I have a Canon HF 10 to shot videos in MTS format. I am a camcorder fan who is interested in researching techniques of camcorder. The Canon HF10 is built around Canon's new 1/3.2in CMOS sensor, with 3.3-megapixels. This is slightly smaller than the 1/2.7in unit used in the HV20 and HG10, which theoretically will put it at a slight disadvantage in low light. Canon has dubbed the HF10 ‘dual memory', because as well as having an SDHC card slot, it includes 16GB of onboard flash memory. During the research I suddenly found that I need to have several MTS merged together to one file. I downloaded several merging tools for MTS but none of them can satisfy me. Accidentally, Aunsoft Final Mate for Mac came to my sight and I found it of great use to help me merge several Canon HF10 MTS files into one. To start, I connected the Canon HF10 to my Mac and Final Mate for Mac automatically ran to ask you whether launch wizard now. I clicked OK and entered the next window. At that moment I was offered to choose to import the MTS files to Wizard tab or backup MTS files to my Mac hard drive. 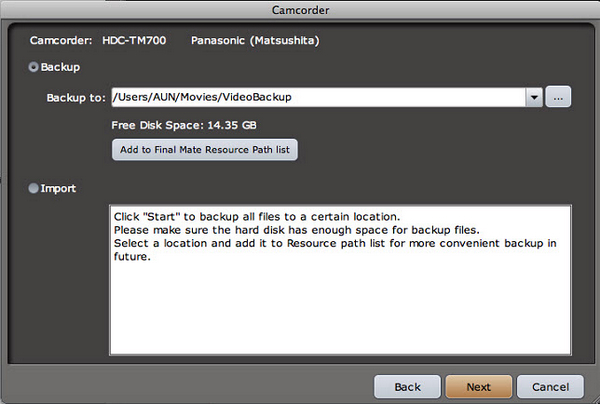 Because I hoped to have a copy for my videos, I select backup option and click Next button. 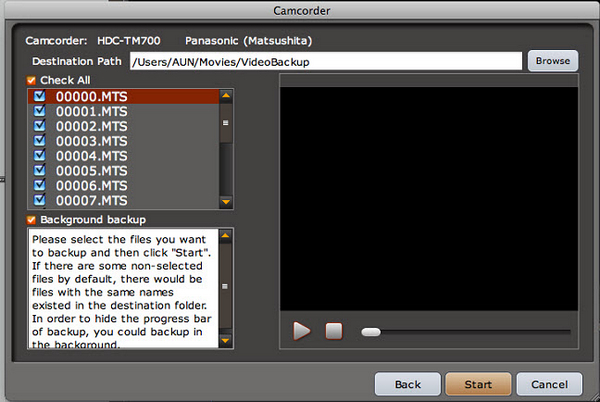 Then I faced a backup interface to set backup output path and choose whether backup MTS files in backstage. It seemed that I could save more time from waiting when I check the box of backup in backstage. Actually I did and I was allowed to face the main interface of Final Mate for Mac. The next steps seemed too easy for me to make it. Drag and drop these MTS files together to the timeline to create a movie for lossless output. And then set the output path if necessary. The last step was clicking on the export button and waiting for a few seconds to get the final MTS file. Above were all I have done at that time, the whole process only took me 2 minutes, allowing me finish the research in time. How to Convert AVCHD MTS/M2TS to QuickTime for Avid Express Pro? I am glad to see that this is the first professional attempt to offer lossless output for HD video. The function that attracts me most is lossless MTS output. I have so much home video of my family and this will help organize it better and make it MUCH easier to watch!